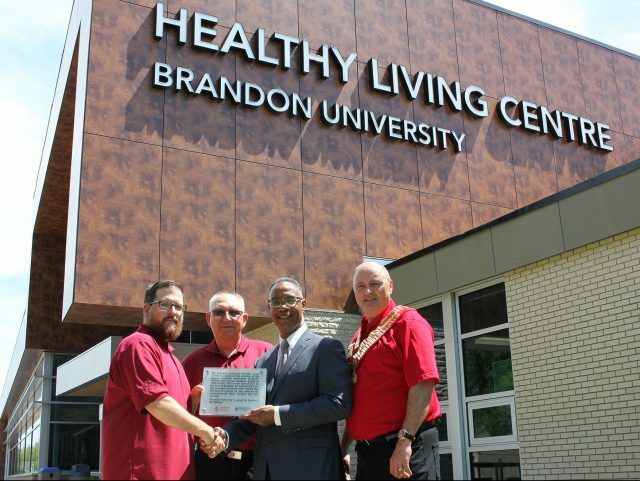 From left to right, Kinsmen Club of Brandon President Kelly Graham and Bar Chair Gord Cappelle, BU President Gervan Fearon and Kinsmen Club of Brandon Governor John DeBeer, pose with a plaque on display at the BU Healthy Living Centre. BRANDON, Man. 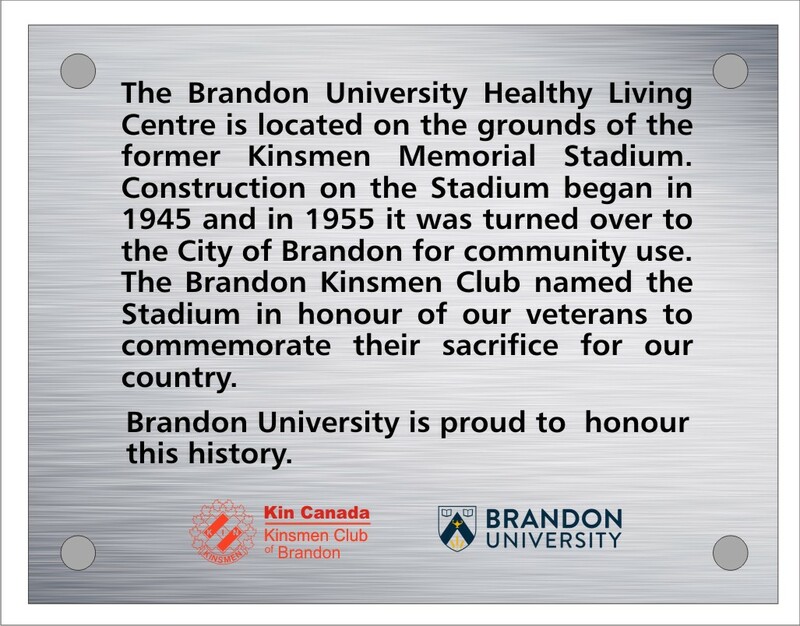 – A long history of recreation, athletics and military sacrifice in Brandon is being honoured at the Brandon University (BU) Healthy Living Centre (HLC). The installation of a new plaque in the HLC lobby gives permanent recognition of its location as the former site of Kinsmen Memorial Stadium. 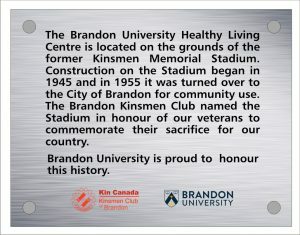 The stadium was built by the Kinsmen Club of Brandon to provide recreation opportunities for the community and commemorate the sacrifice made by veterans in service of Canada. Construction began on Kinsmen Memorial Stadium in 1945, and improvements continued over the next 10 years, resulting in facilities for baseball, softball, track and field, soccer and rugby, as well as a playground. When it was turned over to the City of Brandon in 1955, it was described by the Brandon Sun as “one of Western Canada’s best sports parks.” The stadium had seating for 3,200 at the time and remained the city’s premier baseball facility for more than 30 years. It served as a venue for the Canadian Senior Baseball Championship, the World Youth Baseball Championship and the Canada Games as well as the home for the legendary Brandon Greys and Brandon Cloverleafs teams. Over time, many of Kinsmen Memorial Stadium’s activities were moved to newer facilities, and the remainder of the stadium was removed to make way for the BU Healthy Living Centre, which opened in 2013. The home of the Brandon University Physical Education programs and Bobcats athletic teams, the HLC is a state-of-the-art facility with multiple gymnasiums, a fitness centre, walking track, outdoor multi-purpose field and comfortable seating and convenience for spectators. It has become the site of many events, including the 2015 Canadian Interuniversity Sport Women’s Volleyball Championship.